Yes, me too! Wait I'm already at the results, I need to introduce the poll first. In April 2013 I asked you guys if you won free plane tickets and could make the trip to one of the world's most desirable theme park resorts, which would it be? 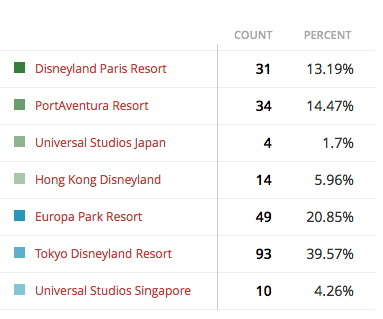 One of the choices I selected for the list stood out high above the others, and that's the Tokyo Disneyland Resort. Yes, me too! Now that works better there. 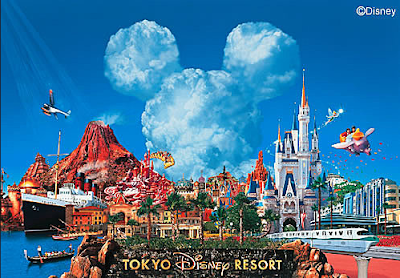 The Japanese version of Disney parks feature some of the favorites we've experienced in North America, combined with some other crazy, high tech, enormous budgeted attractions that personally leave me drooling. Our number two winner was Europa Park in Germany and since we have a lot of ride fans as readers I can't blame that choice, either. Europa Park combines beautiful theming with unique rides that go far beyond just showing off what Mack is capable of. From a B&M Megacoaster to a highly rated Great Coasters International ride, it's got a lot to offer. Plus several resorts are included in the grounds, so it would make a great getaway! This month's poll is now live, check it out over on the left!